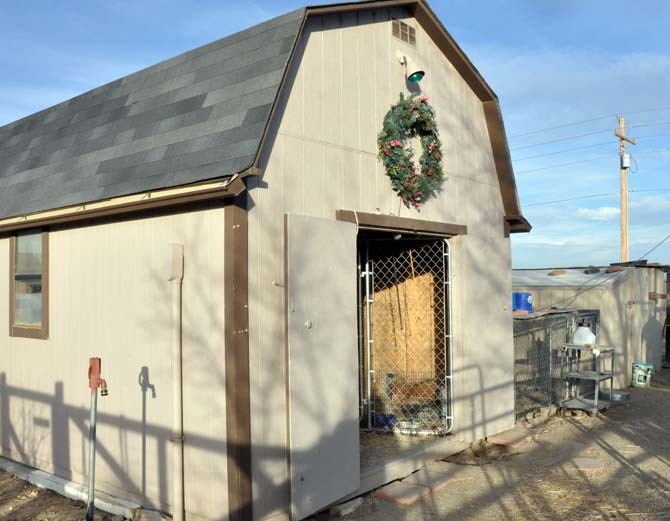 A beautiful Christmas wreath sits over the door of the chicken barn at Kathy and Bill Busch’s house, but the peace and joy of the season has been seriously damaged. It wasn’t the Grinch that stole Christmas this year – it was a mink. Over the course of two nights 25 of Busch’s flock of 30 chickens were killed; some disappeared, the remaining decapitated. Nine were killed the first night, and they suspected Major, a feral/tamed cat they have adopted as the culprit. But the second night when 16 more of the flock was found killed in the same manor – and Major was accounted for – the Busch’s knew that they had a big problem. Mink have sharp teeth and are very dangerous. Busch took some of the birds to Dr. Millissa Culver, her veterinarian, in Longmont, to see if the animal that was killing the birds could be identified by the manner of the killings. Dr. Culver determined that the culprit was probably some type of a weasel. When Busch returned home she caught a glimpse of an animal when she entered the barn – dark colored and a little over two feet long. It disappeared before she could identify it, but she though it might be a protected species. Busch then called the Colorado Division of Wildlife (CDW) for possible answers and support. 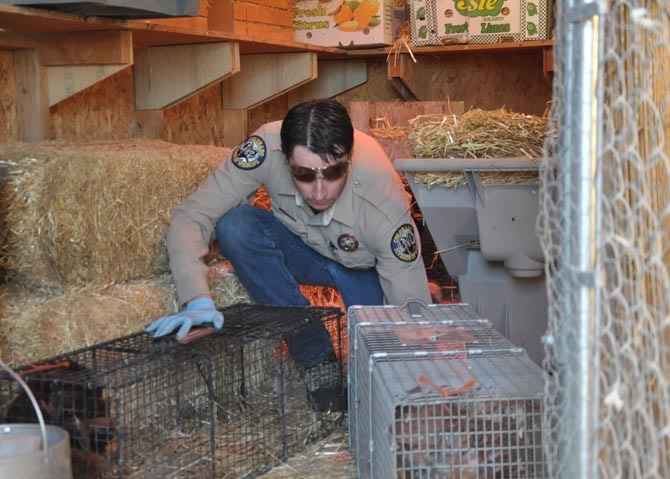 Two live traps were set and baited with the help of Ben Gallowich, Wildlife Technician with the CDW; the remaining five chickens were moved to a cage with some homing doves; and the Busches settled in for the third night. Next morning a very sweet looking little mink was sitting in one of the traps. Ask most people along the Front Range to name wildlife that inhabit the area and mink will almost always be left off the list. In reality they should be right there with the raccoon, skunk and fox as local wildlife. As more reservoirs and lakes have been established in this formerly high desert – short prairie grass land, that was the Front Range, the habitat has become much more alluring to this small carnivore and their presence is growing in numbers. Mink are most at home around water; streams, lakes, rivers that have brush, tall grasses, and trees near-by; or by other areas that have a consistent water source available – like the water troughs found on many farms. They are excellent swimmers, at home in trees and quick on land; they eat frogs, fish, birds up to the size of chickens, rabbits, and other small animals, their favorite being muskrats. Few local animals prey on them other than owls, coyotes or bobcats. The “sweet” look is deceptive. They are not a social animal – even with each other. 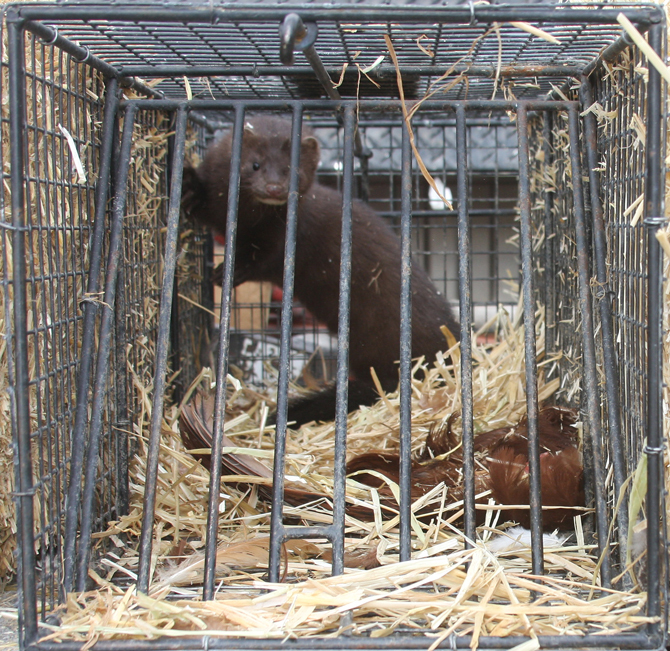 Mink occasionally indulge in “surplus killing,” killing much more than they can possibly eat, when presented with an abundance of food, such as in a poultry house full of chickens. They will often take the time to line-up or stack the kill and horde the food for later use. Mink can become bold when their curiosity is aroused, and are fearless when confronted. 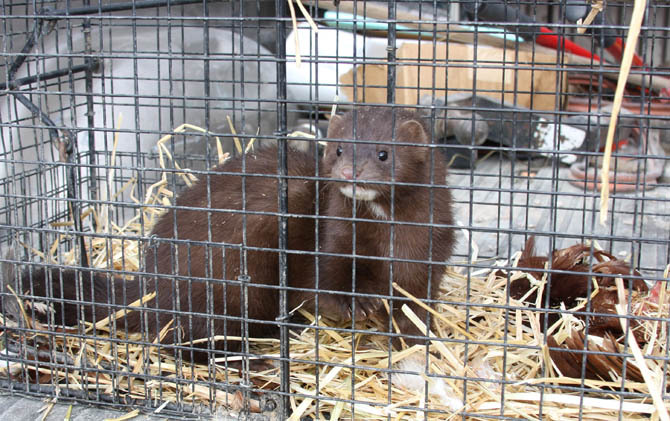 This little mink approached people step for step when the trap was approached, and proved short tempered with its predicament. 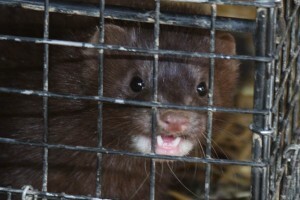 Mink are protected furbearers in most states. Most states, however, have provisions for landowners to control furbearers which are damaging their property at anytime of the year, so you should check with your state wildlife agency before using any lethal controls. 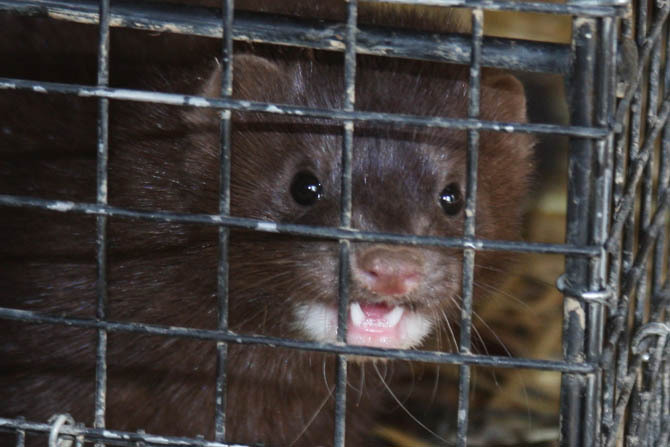 Wildlife Technician, Ben Gallowich, returned the next day to relocate the mink to a location nearer to a natural water source – and away from tempting chickens. The traps were reset. The animal Kathy Busch saw Tuesday morning was much larger than this one. Kathy Busch has worked doing wildlife rehab for over 20 years, and it is not unusual to find Canada geese, blue jays, or finchs as a short term house guests. She has also has had a yard full of horses, sheep, dogs and cats that thrive under her, and Bill’s, care. In 1998 Kathy established the Colo.Wy Wildlife Rescue Center, Inc., a tax exempt organization dedicated to wildlife preservation and protection, and is happy to accept public support. She says that she would love to eventually have youth and youth groups come to her place to learn firsthand about the animals and their needs and care. Busch had been collecting about two dozen eggs a day and either donating them or selling them to help pay for the feed. 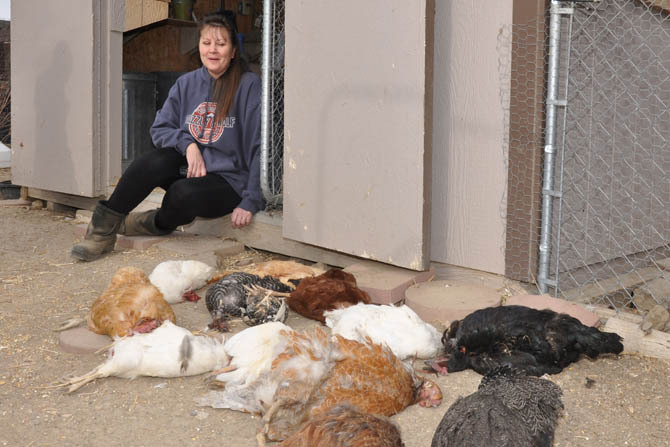 “The loss is devastating,” Kathy says, “A lot of them were pets.” She hopes to reestablish her flock in the spring. If you are interested in helping with this project donations can be sent to Colo.Wy Wildlife Rescue Center, Inc. CWRC/Kathy Busch, 4600 Meining Rd., Berthoud CO 80513. Site contents copyright © 2019 Recorder Online	except as noted. All rights reserved. | 140 queries in 2.504 seconds.